The other day I was in Bruges and discovered a cute bakery named Juliette’s Artisanale Koekenbakkerij. Brenda Keirsebilck, the owner, was once working a stressful job in the advertising business, but then switched career to become a baker. Her bakery is mainly inspired by French recipes from Bretagne, although her cupcakes and whoopie pies also give away some inspiration from the US and UK. Being in the shop, my eye fell on a recipe book for ‘speculoos’, the famous Belgian spice biscuit which I absolutely adore in every shape and size. Just like I love to wear new clothes for a night out after a day of shopping, I usually hurry into my kitchen after buying a new cookbook. When I came home that night, I checked my kitchen cupboard to find which ingredients I had ready for trying out one of the recipes immediately. I was happy to find everything I needed for a speculoos risotto was available at hand. The recipe is very simple and I must also add that the result I got wasn’t mind-blowing, but definitely an original interpretation of the classic rice pudding. 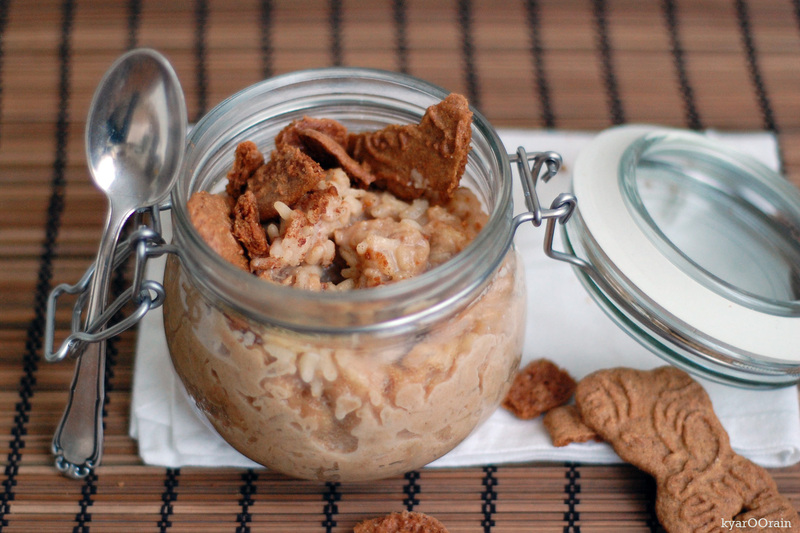 Speculoos risotto – 4 serves: 500ml whole milk, 150g speculoos biscuits (2/3 to use during cooking 1/3 for decoration), 1/8 tsp cinnamon, 30g butter, 100g risotto rice, 100g ‘blond cassonade’ sugar, 2-3 tbsp mascarpone. Boil the milk and add 100g speculoos, broken into pieces. Stir in the cinnamon and put aside. Melt the butter in a risotto pan (or any deep pan). Add the risotto rice and stir well until translucent. Add the speculoos milk little by little, and keep stirring. Continue until the rice is al dente. You might need to use a bit more milk than indicated above. Add the sugar and the mascarpone to your liking and decorate with some speculoos biscuits for serving. Juliette’s bakery is open daily from 10.30am to 6pm, Wollestraat 31a, 8000 Brugge.